A good man goes, head held high. Ethical cleansing in reverse? Justice Hegde chuckles when it is suggested that he is perhaps now the most famous Bunt (a prosperous land-owning community of coastal Karnataka) after Aishwarya Rai and Shilpa Shetty. “Why after them?” he retorts playfully. He is aware, of course, of the hype surrounding him; also his phenomenal success and now the aura of a martyr that has brought him stardom. Hegde’s predecessor, Justice Venkatachala, joined the BJP after he demitted office, but Justice Hegde is clear that isn’t the route he will take. “My no to politics is firm. This is not something I’m telling you today. I said this even when a former chief minister, whom I indicted in my mining report, alleged that I had an understanding with Yediyurappa. I had said then that if I contest an election, don’t give me a vote, give me a slap. I stand by it.” This prompts another colleague of his to say that he is occupying a “nebulous middle” after segregating the public and the state. The web through which politics and business interests feed each other is something Justice Hegde is wary of. Justice Hegde is certainly not naive. He does understand that these two categories are not water-tight, but he goes to the other extreme. Perhaps his position at present stems from a deep personal hurt. In fact, he indicts the entire public. He believes that the higher strata of society want corruption to exist because they are the ones who benefit from it. “They invest their money power in politicians and bureaucrats and in return get huge dividends.” The middle class, he argues, suffers all of this, complains about it but does not want to do anything. “They don’t want to be dragged to the courts.” And the poor are submissive to corruption. “They have to pay even for their basic necessities. I read somewhere that in Karnataka every third person with a BPL card has to pay a bribe for drinking water. Can there be anything worse than this?” he asks. People who have known Hegde’s father—Justice Kawadoor Sadananda Hegde—are surprised by his revulsion for politics. After quitting the Supreme Court in 1973 to protest the supersession by a junior judge (Justice A.N. Ray) for the post of chief justice, the senior Hegde had joined the Jayaprakash Narayan movement during the Emergency. Later, he contested on a Janata Party ticket from the Bangalore South constituency against Congressman and former chief minister Kengal Hanumanthaiah and was elected to the sixth Lok Sabha, in which he also held the Speaker’s post. After stepping down, he even became the national vice-president of the BJP. Prior to this, he was a member of the upper house of Parliament in the ’50s. “My father was a Congressman until certain developments happened in that party. He always wore khadi and he was opposed to the communal politics of the Jan Sangh,” insists Justice Hegde. Earlier, Justice Hegde himself has been close to non-Congress governments in the state and Centre. When Ramakrishna Hegde (not related) was chief minister, he was an advocate-general, a post he quit when Hegde resigned and S.R. Bommai took over. He was additional solicitor-general of India between 1989 and 1990, when V.P. Singh was prime minister, and then became solicitor-general between 1998 and 1999, when Vajpayee was prime minister, before being appointed to the Supreme Court. In 2006, the H.D. Kumaraswamy-led coalition government made him Lokayukta. 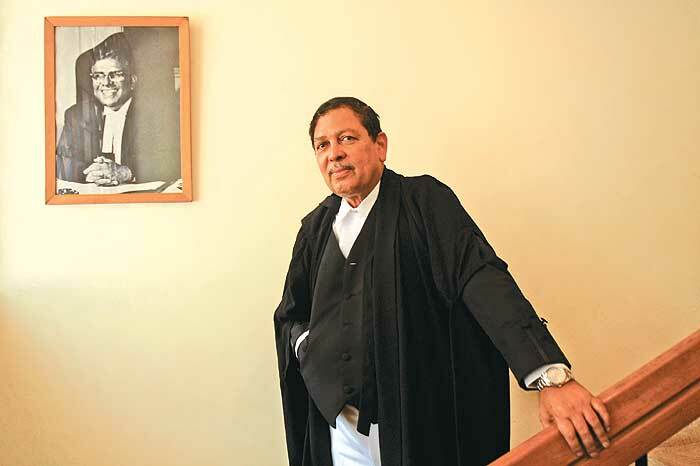 “After my father quit the SC, he could not work in any court, but he advised me to file applications for the detenus held in the Bangalore Central Jail during the Emergency. Through me, he came in contact with L.K. Advani, Vajpayee, S.N. Misra and other leaders,” he says. Justice Hegde has led a good life. “My wife and I have no children, but we have a close-knit family and a small circle of friends. We have travelled three-fourths of the globe together. When my practice was good, I used to travel first class. I have travelled on the Concorde some three or four times. I have stayed in the best of hotels. Between 1977 and 2006, until I became Lokayukta, I went to the US once a year. I went so frequently because I have a paraplegic brother-in-law there who lost the power of his limbs in an operation. I had promised my sister I will visit them every year. As soon as I retire, I owe her a visit.” And, of course, he promises to remain a “freelance speaker” against corruption.